Audicus is Here to Serve Your Hearing Loss Needs! We here at Audicus are looking to transform the way the world hears. What does that mean? Providing our customers with top hearing loss technology available at the world’s most competitive prices. Audicus is forging new frontiers within the hearing aid marketplace. Since launching in June 2012, we’ve already saved customers over $12 million dollars – and that’s just the beginning. Most recently, we’ve partnered with style icon, Ari Seth Cohen, to bring you an incredible new line of fashionable hearing aids, guaranteed to let you live out loud with incredible style. We pride ourselves on providing the best hearing aids with the lowest markups available. Traditional providers and manufacturers are known to mark hearing devices up more than 10x to cover overhead and other miscellaneous costs. We here at Audicus cut out the middleman by working with a top-tier, independent German manufacturer and delivering directly to you, at your home. Since insurance doesn’t cover most hearing aids, this makes our services completely unique and absolutely essential to the marketplace. We’re proud to say we’re totally transforming the business model of how hearing aid technology is sold and consumed. 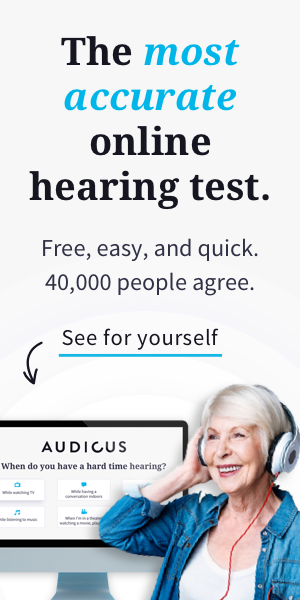 Audicus helps you find your perfect hearing aid match. You can easily find us online, send your hearing test by fax, email, or uploading it onto our site, and with your information at the ready, we recommend the best product to fit your specific hearing loss needs. Next, our in-house audiologists customize and program your hearing aid based on your specifications. Finally, it’s time for you to test out our product for yourself. Get a free 45-day trial and if you’re not completely satisfied, we’ll give you a full refund – no questions asked. Questions or concerns? We provide on-demand support by phone, email, or online chat to help you in any step of our process. Want to speak with an audiologist? Our in-house professionals serve as hearing experts, working to ensure that we deliver the best, most medically advanced and up-to-date digital hearing aids. Even better, Audicus offers quick processing! We know you’re counting down the days to better hearing, and so are we. Once you submit your information, you’ll receive your hearing aid in the mail in 5-7 business days. And U.S. shipping? It’s totally free! The Uno is the ultimate in discretion, ease, and simplicity. Running $499 an ear, it’s intended for mild to moderate hearing loss. And with it’s ultra discreet design, it’s almost invisible to the eye and fits completely within the ear. The auto-adapt volume setting adapts to your specific listening environment, providing our customers with the clearest listening experience possible! We believe everyone deserves to hear. That’s why we’ve teamed up with Hearing Charities of America to collect used hearing aids, which will be refurbished for low income individuals. Please send us any hearing aids you have that are not in use! We have the best customers in the world and we’re thankful for your continued support. Find your affordable Audicus hearing aid today! Hi Don, have you looked at our products at http://www.shop.audicus.com. You can also call our customer service at (888) 979-6918 to find out which device is right for you. We are on Medicare we cant afford$ 5.000 hearing aids. send me more info please! How do I get my hearing test? I am a retired speech therapist, taught at a school for the deaf back in the 70’s, worked with speech impaired kids since then till retirement. Lost a lot of hearing due to infection about 13 years ago. Have had a couple digital aids, love them. Hearing birds again and wind in the trees.